Amid a disappointing showing that fell well short of Stanley Cup expectations, the St. Louis Blues fired coach Mike Yeo a quarter of the way into the season and named Craig Berube as his interim replacement. 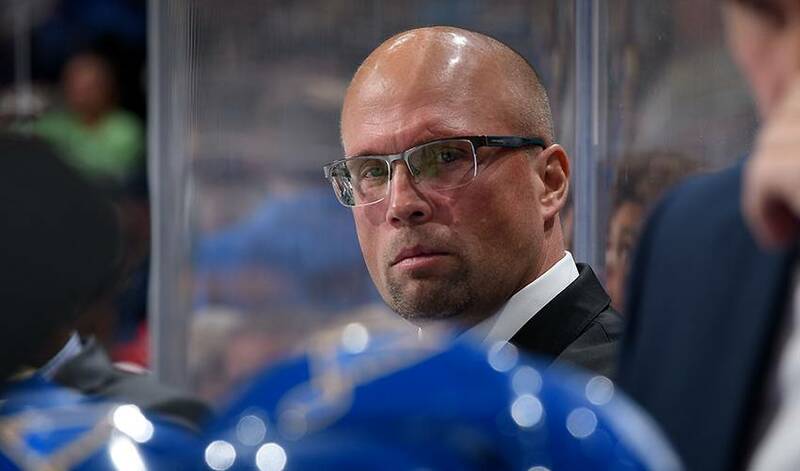 ST. LOUIS — Amid a disappointing showing that fell well short of Stanley Cup expectations, the St. Louis Blues fired coach Mike Yeo a quarter of the way into the season and named Craig Berube as his interim replacement. St. Louis general manager Doug Armstrong announced the change hours after Monday night's loss to the Los Angeles Kings, the Blues' third shutout in the last four games. At 7-9-3, the Blues are in last place in the Central Division, and their 17 points rank next-to-last in the NHL, ahead of only Los Angeles. Something had to give for the Blues after they failed to make the playoffs last season, falling one point short when they lost to Colorado in their 82nd game. They lost in the second round under Yeo in 2017, after he was a midseason replacement for fired coach Ken Hitchcock. After no coaches were fired last season, the 45-year-old Yeo is the third NHL coach to lose his job this month, following the Kings' John Stevens and the Blackhawks' Joel Quenneville. Yeo went 73-49-11 in parts of three seasons with the Blues, with one playoff series victory. Berube had been an associate coach on Yeo's staff since the summer of 2017. Before that, he was coach of the Blues' AHL affiliate and has NHL head-coaching experience from parts of two seasons with Philadelphia. The 52-year-old Berube is a midseason replacement for the second time, after replacing Peter Laviolette with the Flyers three games into the 2013-14 season. Berube played 1,054 NHL games and racked up 159 points and 3,149 penalty minutes. Yeo joined the Blues as an assistant in 2016 after five seasons with Minnesota. The Wild made the playoffs in three of Yeo's four full seasons, and he was fired 55 games into 2015-16. The Blues came into the season with championship aspirations after acquiring centre Ryan O'Reilly in a trade from Buffalo and signing forwards Tyler Bozak, Patrick Maroon and David Perron. Yeo was considered to be on the hot seat, and two consecutive losses led to his dismissal. Following the late-night announcement, the team called a news conference for Tuesday morning with Armstrong and Berube.